You might have heard about the rapidly rising popularity of tungsten rings. This might have inspired you to look further at the possibility of buying a tungsten ring, either as a wedding band for yourself, as a fashion accessory, or as a gift for someone on a special occasion. While tungsten rings on their own are brilliant, one of the best things about considering tungsten as a purchase for yourself or someone else is that you can customize it however you want. Here are some examples of how you can do this. If you’re happy with a basic tungsten ring, you can still customize it to make it look different. The easiest way to do this is to opt for a brushed tungsten ring. This doesn’t add anything to the ring, but will leave you with a two-tone effect and add something different to your ring. Many people choose to take their customization of a tungsten ring far beyond the basics. One of the most exciting possibilities you have at your disposal is to have your tungsten ring inlayed with a specific material. This option enables you to be as adventurous as you want. You can go for something relatively simple and conservative such as wood, or you can go way towards unique and unusual by choosing a material such as caribou antler, dinosaur bone, or even meteorite. If an inlay doesn’t appeal but you still want a unique tungsten ring, then you always have the option of going for a black one. Black rings are becoming increasingly popular, not just as a fashion accessory but as a wedding ring choice, and our final customization idea looks awesome if you have a black ring, too. 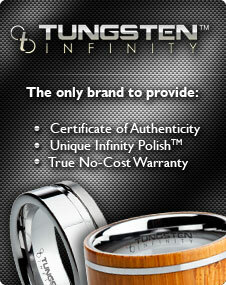 The finishing touch to any customized tungsten ring is the laser engraving. The great thing is, you can add this to any tungsten ring, meaning if you’ve gone for the basic option you can still have a personalized message on the inside or outside. With a black tungsten ring, the engraving will expose the brilliant shine of the diamond polished tungsten underneath, and give you a unique and stylish ring that will impress everyone who sees it.